OpenFin Challenge – How did we succeed within 22 hours? This is a descriptive story and self-reflective analysis of how four service design fellows & a tech consultant succeeded to come up with a strategic service ecosystem concept with viable business model just within 22 hours – and to convince a heterogeneous, multidimensional and highly professional jury. Open Innovation in Finance Business (OpenFin) is Aalto University project powered by OP-Pohjola and Futurice. The organizations invited creative minds to create new innovative financial service concepts for consumers and small enterprises. OpenFin Hack & Ideathon – an open innovation challenge for future financial services was about to begin. And we were registered in! After I received green light from my employer to join the event, my participation was confirmed too. Agreement was extremely essential statement for me because I work with financial services myself and have high professional ethics. 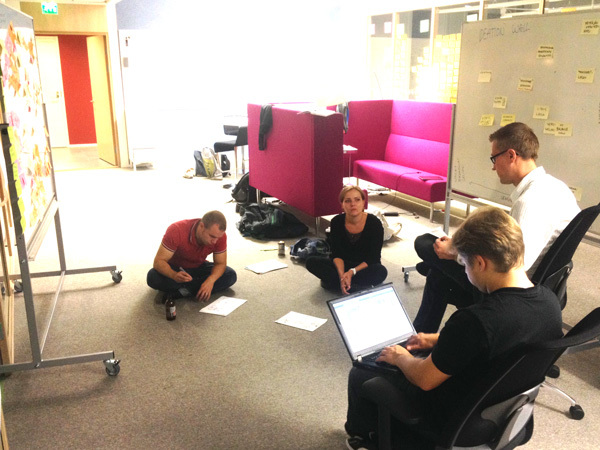 At 6 p.m. in Friday 26th September 2014, about fifty talented service designer, developers, entrepreneurs and student with different backgrounds met at Aalto University at Open Innovation House. While other working-class citizens were looking forward to relax, eight creative teams were about to solve some financial service challenges collaboratively. There we met again, feeling exited. Minna Myyryläinen, Jaakko Porokuokka, Mika Keskiväli and myself. Four 2nd year MBA students from Service Innovation & Design program from Laurea University of Applied Sciences. We were happy to welcome Technology Consultant Lassi Jatkola onboard to make our team more versatile. Lassi made sure that our team was also capable to code & hack some Proof Of Concepts if needed. OP-Pohjola provides an OpenAPI Developers documentation to empower external individual developers and communities to create the future banking services themselves. The company believes that innovative service solutions can be achieved by providing and creating the required tools in collaboration. The rules were fair: each team owns their rights for their service concept. This is it how it should go: otherwise the principles of open innovation would collapse. As a designer, I follow with great interest how companies are opening up their closed frameworks for 3rd parties to play with. Open data is an enormous opportunity – or actually a must – to deliver truly seamless digital services. Otherwise all the designed service concepts that have been created with passion to improve quality-of-life and to bring value for people & business will remain torsos. Or at least developers inside the closed companies need immeasurable amount of hours and sweat to invent and reinvent the required expensive dirty tricks. Cutting corners from design leads inevitably to poor user experience and to lose-lose-lose situation. The competition had three categories: Consumer App Innovation, Entrepreneur App Innovation and Business Ecosystem Infrastructure Innovation. The both App Innovation categories shared the same core principles: to create value for consumers or small enterprises, freelancers and start-ups through new innovative financial services. The challenge in Business Ecosystem Infrastructure Innovation was to make development and operating of business models & new service concept easier and more efficient. After having welcome drinks, dinner and mingling, the project manager and organizer Mojtabaei Renani Mahnoush from Aalto OpenFin opened up the event. Next, Juha Viljakainen and Jouni Lähteenmäki from OP-Pohjola shared their vision of how banking services are developed in collaboration with creative and passionate people outside the company. Business Developer and Mobile Services Lead Innovator Kristian Luoma from OP-Pohjola, gave also an inspiring kick-off speech: “Future digital business vision in financial sector“. Kristian discussed through how 11 predictions financial services may evolve in future. It was time to start with the challenge. We started to crawl through knowledge available. What kind of world do we live in? What is happening in our society, in economics, ethics, politics, environment, technology and so on? 15 global challenges gave us a holistic approach to discuss what should be fixed in Planet Earth. We also discussed through out the shared OpenAPI Developers documentation with Lassi to understand what the API was capable to and visualized the framework quickly. By sitting on a carpet, walking around the room and continuously discussing we came up with several small ideas that we concretized into idea drafts. We did not know where we were going to but we felt if we were on the right track – and when not. At 2 a.m. in Saturday night some teams were still hacking, coding and ideating; some folks were sleeping here and there, letting mind to recover before the next day. We had already few great and essential idea drafts on the wall. So we decided to do the same and get some sleep. Mmm… Saturday morning kick of with Coffee. Anton Schubert, Head of Design from Futurice, give an inspiring and awakening speech of “Digital Services as Dialogue Tools“. Anton discussed about customer empowerment, transparency, equality, dialogue, customer experience and social revolution. He also shared some great examples how previously strongly product and industrial oriented have started to change the way they treat and think about customers – people behind within service encounters. There it finally was! Our multidimensional service ecosystem idea right on the table presented with few LEGOs. After getting back in business it didn’t take a long time to collaboratively connect all the pieces we had in our hands & minds. We came up with a clever financial service ecosystem concept that would provide win-win-win value for everyone. The concept was developed collaboratively with our team by showing ideas and telling stories with LEGOs. And when we felt that the Business Model is strong and viable, we invited Anton Schubert, Jane Vita, Heli Hautala, Riku Valtasola and other coaches from Futurice, OP-Pohjola and Apps4Finland to question our service idea and to improve it. And there it finally was! Our multidimensional service ecosystem idea right on the table presented with few LEGOs right on the table. And everybody got the idea in same way. It was now super easy to continue and prepare for the final pitching. There it is! Our big idea to continue with! Mika and Minna focused to think in more detail level how our strategic and slowly evolving service ecosystem concept would engage investors in step by step. They took care to visualize service attributes within the Business Model Canvas. I focused to think and prepare what was needed for final presentation and how to convince the jury. 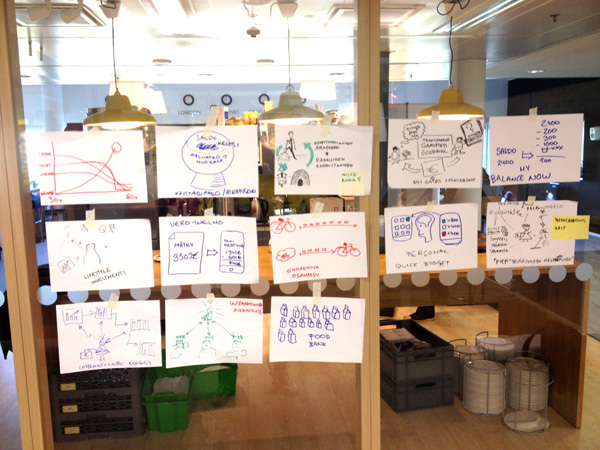 Me and Jaakko drafted also three idea posters – one from each service evolving & launch stage. In the end we completed three final posters. Jaakko did also an excellent user interface mockup to bring more flesh and bones for the concept’s first stage. Lassi did awesome work by drafting a suggestion how to evolve the API and to convince the architects within the jury that our service concept is really possible – without any compromises. 21 hours of fun and hard work behind. One hour remaining. After fifteen minute naps on sofa, pitching practices, and last-minute practical preparation we were ready to face the final pitching. Happy team having some beers, ciders and feeling exited before giving the final pitch for the audience. Needles to say, but all the service concepts within the competition were extremely well-thought, innovative, creative and fun! Lots of iterative, testing and improving work was made! It was so nice to see how well all the teams kept people, experiences, emotions, Business Models and win-win-win value in focus – not products or money flows itself as traditionally has been seen in financial services. “Who’s messing here?” The office after serious play. Time to clean up, say cheers and get home. See you again! Why we succeeded and felt satisfied in the end? The OpenFin event ended a two days ago. It’s time sum up and analyze what happened. I have spent a lot of time just thinking and rewinding how on earth our team succeeded to come up with such an innovative and strategic financial service ecosystem concept just in 22 hours? Why were we really satisfied in how we worked together? Why the concept was lauded and achieved an Honourable Mention? Why the jury described the concept something like: “Highly human-centric, innovative, strategic service ecosystem concept with clear life-cycle that would provide value for all the participants and feed itself”. What was offered, what we had and how our team achieved flow? Minor bureaucracy. People just arrived the house, mingled, ate well, got inspired and started to work. We were able to left and enter the building when we wanted to. No interruptions. Other teams passing by randomly did not disturb. We had lot of space and the needed peace to work passionately how we felt the best. A lot of Post-ITs. In different colors and sizes. “The right people on the bus”. Our team consisted of heterogeneous people with a variety of skills but with the same positive can-do mindset. We were capable to communicate about our visions and how technology could enable the concepts. We respected and empathized each others. We encouraged each others to go for the challenges. We really listened to each others. Not to respond. But to understand. We kept on explaining and showing our ideas without falling in love with them too much. We did not dwell or argue with ideas where we didn’t have time to. We shared the same optimistic attitude. We believed that we will find the final viable service concept evenat 2 a.m. Saturday night while other teams were having sweet dreams on sofas. Service, System and Business Design Thinking skills. We iterated our concept between big pictures and smaller details by rethinking. We did not just solve the jigsaw puzzle. We had to create the pieces first. A toolkit filled up with service design methods and tools to pick when needed. And capability to apply them rapidly within context and practice. Skills to crystalize and concretize ideas. Habit to draw, show and explain even ugly stick figures to tell ideas as stories. Low-tech, concrete ideas. We questioned our own big idea, collapsed it in time to time, rethought and rebuilt the concept stronger. We focused within the problem, not in products. The name of the concept, I love Shares!, was a side way that someone of us just came up with. And we have been with the right people in the right place! Looking forward for the next hack & ideathon!